Amongst the twintails, the fantail is relatively easy to breed. The finnage is important, and the tail must have the right kind of forking. Some years ago, there were two standards: one for a longer, thinner tail and one for a shorter, stumpier tail; these are now combined into the present, intermediate standard. Caudal fin to be divided and forked with slightly rounded well spread lobes held above the horizontal. Dorsal fin to be single, all other fins to be paired and their extremities slightly rounded. Minimum length of body to be 5.5 cm (2¼ inches). The fish should be bright and alert. The body should be short and rounded with a smooth outline. The caudal should be well divided, forked and held high without drooping. 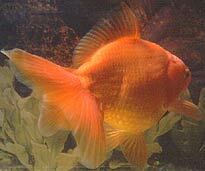 This is a breeder's team of four metallic red fantails (plus three reflections!) bred in Spring 2000 and presented at BAS 2000 in September. Four very fine adult fantails: two self-coloured red metallics, one red/silver-white variegated metallic (see Further Images for another view of this individual) and one calico fish. Notice the relatively short finnage (compared with the veiltail), with tails well forked and spread into a fan shape, held high and without drooping. Fairly good quality fantails, unlike the rest of the twintail goldfish types, can be bought from many shops and at a reasonable price, so they - and the common goldfish - are a sensible starting fish for the novice breeder; that said, it is very possible to buy poor quality fish from many shops, so it helps to know what a good fantail should look like! A few specialist shops sell high quality fantails, although often with finnage too long for the ideal, show-standard fantail. 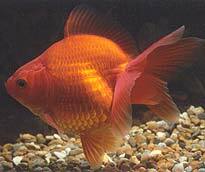 One successful breeder bought 8 fantails from a shop six years ago: the fish had good colour, body shape and finnage but not-so-good tails. He has stuck with his original fish rather than make any outcrosses and now has a breeding stock of 20 fish (10 males, 10 females). As a general rule, pairing is mother-to-son, but always the best fish are selected for breeding. In six years no improvement in the strain has been noticed, but nor has there been any deterioration, and they were quality fish to start with. The fish start chasing in March and are mostly left to spawn naturally, with perhaps 10% hand-spawned for specific pairings. The adults are fed on pellets, daphnia and frozen bloodworm; the fry are fed on brine shrimp for the first 2-3 weeks and then on porridge, daphnia and pellets. The first cull is carried out when the fry are 4 weeks old, selecting for twin tails; a second cull is made at 8 weeks selecting for body shape and tail shape; then a third cull at 12 weeks selecting again for body and tails; a final cull at 16-20 weeks selects for colour. Out of 3,000 fry bred each year 20 or so are kept, giving a return of 150:1 which is similar to the success ratio for lionheads and Bristol shubunkins. 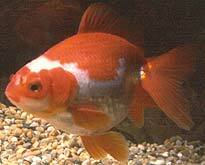 The young are raised in tanks in the fish house, then brought on in ponds where they overwinter, being very hardy. Water changes in the fish house are typically 100% weekly on a continuous flow system. Trouble from pests and diseases is usually minimal, owing to the high degree of isolation from other fish or other bodies of water. 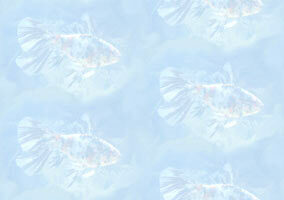 Fantails live for about 10 years and, as described above, are hardy fish, happily living outdoors in ponds.